We are getting political on Plain Chicken. Well, not really. Every election Family Circle has a contest between the two First Lady candidates. I decided to give both cookies a try. First up is Michelle Obama's White and Dark Chocolate Chip Cookies. I did make a change to the recipe. The original recipe had one cup of butter and one cup of shortening. I felt like that was a typo - if it wasn't that is WAY too much butter/fat for a decent cookie, so I went with just one cup of butter. If you try it with both butter and shortening, let me know how it works. These cookies were so good. They were crispy on the outside and soft on the inside. We really loved the different flavors of chocolate chips in the cookie. I took some to work and they were gone in a flash! 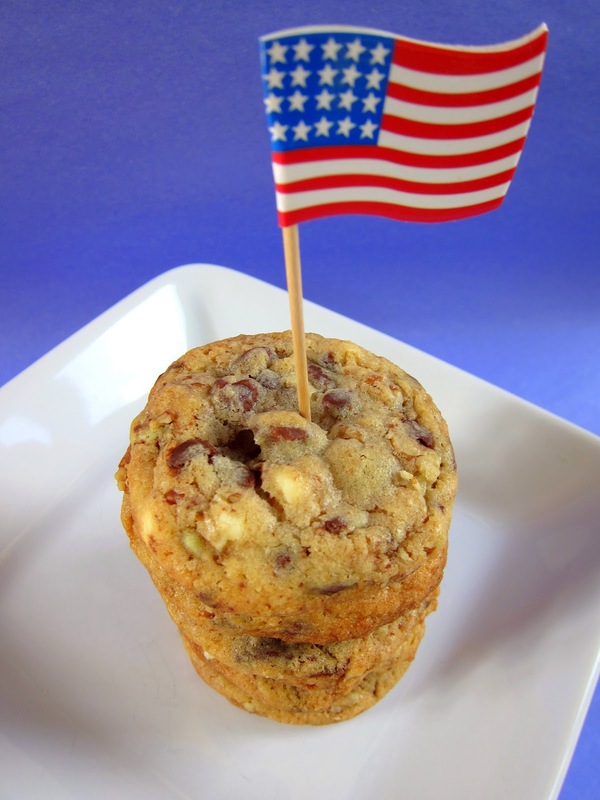 Next week I will share Ann Romney's cookie (it was delicious too). In a small bowl, whisk together flour, baking soda and salt. In a large bowl with an electric mixer, cream butter, granulated sugar, brown sugar and vanilla extract. Add eggs, 1 at a time, beating well after each addition. On low speed, beat in flour mixture. 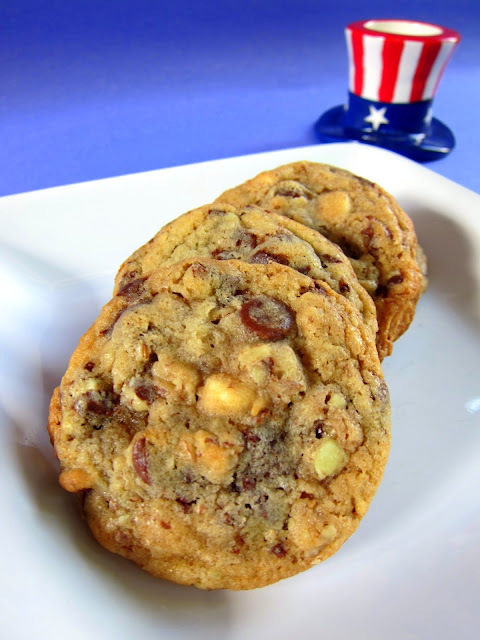 By hand, stir in white and milk chocolate chips, mint chips and pecans. Bake 10 to 12 minutes or until golden brown. Cool on baking sheets for 5 minutes; remove to wire racks to cool completely. I'm wondering if it was supposed to be butter OR shortening? They look good. Surely it is a typo. They do look good. I always enjoy your recipes and this one is no exception - also wanted to let you know that I pinned your tailgating puffs recipe in August I think, I also changed it posted it on my blog. Your recipe, that I pinned, has almost hit 800 repins! I know you must be used to that because you do such a great job, but I wanted to let you know anyway! Kelli - thanks for pinning my recipes - 800 repins is unbelievable! Doesn't seem to be a typo -the recipe calls for both butter & shortening in the ingredients and in the directions- not very healthy. Ann's recipe with oatmeal & peanut butter seem more wholesome - just like Ann & Mitt do. This is basically the recipe on the back of the Nestle package. The other is basically a monster cookie. Neither one is "healthy" per say, it's just a cookie, no snide comments necessary. Both look like good recipes to me. I’m so excited to try these white and dark chocolate cookies! I will definitely try this at home and give some of it to my friends in catering suffolk! I did try the recipe with both shortening and butter - exactly to the recipe. They did not turn out well. As you stated, that is WAY too much for a decent cookie. I want to try a mixture of butter and shortening, but with only 1 cup total. Also, I noticed your version has pecans, but the one I saw has walnuts. Was that also a change? Thanks for posting this topic! I was very curious about the recipe, especially since they turned out so badly.